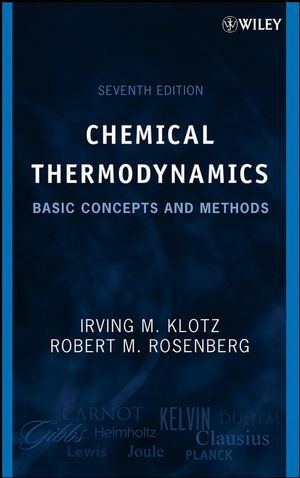 Covers the logical foundations and interrelationships of thermodynamics and their application to problems that are commonly encountered by the chemist. Logical arrangement of the material to facilitate learning, including worked out examples. Computational techniques, graphical, numerical, and analytical, are described fully and are used frequently, both in illustrative and in assigned problems. Irving M. Klotz, PhD, deceased, was a noted expert in chemical thermodynamics and the physical chemistry of proteins. Dr. Klotz was elected to the American Academy of Arts & Sciences in 1968 and the National Academy of Sciences in 1970. He joined the Northwestern faculty in 1940 and retired in 1986. Dr. Klotz was named a Fellow of the Royal Society of Medicine in 1971 and published more than 200 scientific articles in peer-reviewed journals. He wrote Chemical Thermodynamics: Basic Theory and Methods in 1950. Dr. Rosenberg began working with him as coauthor with the third edition. ROBERT M. ROSENBERG, PhD, is Emeritus Professor of Chemistry at Lawrence University and an Adjunct Professor of Chemistry at Northwestern University. 1.1 Origins of Chemical Thermodynamics. 1.2 Objectives of Chemical Thermodynamics. 1.3 Limitations of Classic Thermodynamics. 2 MATHEMATICAL PREPARATION FOR THERMODYNAMICS. 3 THE FIRST LAW OF THERMODYNAMICS. 3.2 The First Law of Thermodynamics. General Form of the First Law. 4 ENTHALPY, ENTHALPY OF REACTION, AND HEAT CAPACITY. Relationship between Qv and Qp. 4.3 Enthalpy as a State Function. Enthalpy of Formation from Enthalpy of Reaction. Enthalpy of Formation from Enthalpy of Combustion. Enthalpy of Transition from Enthalpy of Combustion. Enthalpy of Conformational Transition of a Protein from Indirect Calorimetric Measurements. Enthalpy of Solid-State Reaction from Measurements of Enthalpy of Solution. Enthalpy of Reaction from Bond Enthalpies. Some Relationships between Cp and Cv. Other Sources of Heat Capacity Data. 4.6 Enthalpy of Reaction as a Function of Temperature. 5 APPLICATIONS OF THE FIRST LAW TO GASES. Enthalpy as a Function of Temperature Only. Relationship Between Cp and Cv. Calculation of the Thermodynamic Changes in Expansion Processes. Calculations of Thermodynamic Quantities in Reversible Expansions. 6 THE SECOND LAW OF THERMODYNAMICS. 6.1 The Need for a Second Law. 6.2 The Nature of the Second Law. Statement of the Second Law. Mathematical Counterpart of the Verbal Statement. Alternative Statement of the Second Law. 6.4 The Thermodynamic Temperature Scale. 6.5 The Definition of S, the Entropy of a System. 6.6 The Proof that S is a Thermodynamic Property. Any Substance in a Carnot Cycle. Any Substance in Any Reversible Cycle. Entropy S Depends Only on the State of the System. 6.7 Entropy Changes in Reversible Processes. 6.8 Entropy Changes in Irreversible Processes. Irreversible Isothermal Expansion of an Ideal Gas. Irreversible Adiabatic Expansion of an Ideal Gas. Irreversible Flow of Heat from a Higher Temperature to a Lower Temperature. 6.9 General Equations for the Entropy of Gases. Entropy of the Ideal Gas. Entropy of a Real Gas. 6.11 Entropy as an Index of Exhaustion. 7 EQUILIBRIUM AND SPONTANEITY FOR SYSTEMS AT CONSTANT TEMPERATURE. 7.1 Reversibility, Spontaneity, and Equilibrium. Systems at Constant Temperature and Volume. Systems at Constant Temperature and Pressure. Heat of Reaction as an Approximate Criterion of Spontaneity. 7.2 Properties of the Gibbs, Helmholtz, and Planck Functions. 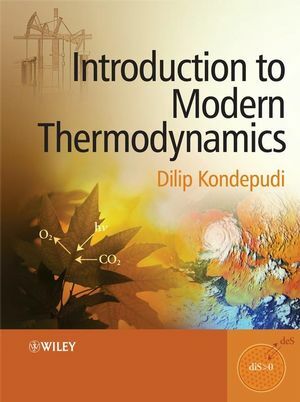 The Functions as Thermodynamic Properties. Relationships among G, Y, and A. Changes in the Functions for Isothermal Conditions. Pressure and Temperature Derivatives of the Functions. Equations Derived from the Reciprocity Relationship. 7.3 The Gibbs Function and Chemical Reactions. 7.4 Pressure and Temperature Dependence of Î?G. 7.5 Useful Work and the Gibbs and Helmholtz Functions. Changes at Constant Temperature and Pressure. Relationship between Î?Hp and Qp When Useful Work is Performed. The Gibbs Function and Useful Work in Biologic Systems. 8 APPLICATION OF THE GIBBS FUNCTION AND THE PLANCK FUNCTION TO SOME PHASE CHANGES. 8.1 Two Phases at Equilibrium as a Function of Pressure and Temperature. 8.2 The Effect of an Inert Gas on Vapor Pressure. Variable Total Pressure at Constant Temperature. Variable Temperature at Constant Total Pressure. 8.3 Temperature Dependence of Enthalpy of Phase Transition. 8.4 Calculation of Change in the Gibbs Function for Spontaneous Phase Change. 9 THERMODYNAMICS OF SYSTEMS OF VARIABLE COMPOSITION. 9.1 State Functions for Systems of Variable Composition. 9.2 Criteria of Equilibrium and Spontaneity in Systems of Variable Composition. 9.3 Relationships Among Partial Molar Properties of a Single Component. 9.4 Relationships Between Partial Molar Quantities of Different Components. Partial Molar Quantities for Pure Phase. Chemical Potential and Escaping Tendency. 9.6 Chemical Equilibrium in Systems of Variable Composition. 10 MIXTURES OF GASES AND EQUILIBRIUM IN GASEOUS MIXTURES. 10.1 Mixtures of Ideal Gases. The Entropy and Gibbs Function for Mixing Ideal Gases. The Chemical Potential of a Component of an Ideal Gas Mixture. Chemical Equilibrium in Ideal Gas Mixtures. Dependence of K on Temperature. Comparison of Temperature Dependence of Î?Gom and ln K.
10.2 The Fugacity Function of a Pure Real Gas. Change of Fugacity with Pressure. Change of Fugacity with Temperature. 10.3 Calculation of the Fugacity of a Real Gas. 10.4 Jouleâ? ?Thomson Effect for a Van der Waals Gas. Approximate Value of a for a Van der Waals Gas. Enthalpy of a Van der Waals Gas. 10.5 Mixtures of Real Gases. Fugacity of a Component of a Gaseous Solution. Approximate Rule for Solutions of Real Gases. Fugacity Coefficients in Gaseous Solutions. Equilibrium Constant and Change in Gibbs Functions and Planck Functions for Reactions of Real Gases. 11 THE THIRD LAW OF THERMODYNAMICS. 11.1 Need for the Third Law. 11.2 Formulation of the Third Law. Statement of Lewis and Randall. 11.3 Thermodynamic Properties at Absolute Zero. Equivalence of G and H.
Î?Cp in an Isothermal Chemical Reaction. Limiting Values of Cp and Cv. Temperature Derivatives of Pressure and Volume. 11.4 Entropies at 298 K.
Apparent Exceptions to the Third Law. 12 APPLICATION OF THE GIBBS FUNCTION TO CHEMICAL CHANGES. 12.1 Determination of Î?Gom from Equilibrium Measurements. 12.2 Determination of Î?Gom from Measurements of Cell potentials. 12.3 Calculation of Î?Gom from Calorimetric Measurements. 12.4 Calculation of a Gibbs Function of a Reaction from Standard Gibbs Function of Formation. 12.5 Calculation of a Standard Gibbs Function from Standard Entropies and Standard Enthalpies. Change in Standard Gibbs Function. 13.1 Derivation of the Phase Rule. Two Phases at Different Pressures. Phase Rule Criterion of Purity. 14.2 Some Consequences of the Definition. 14.3 Thermodynamics of Transfer of a Component from One Ideal Solution to Another. 14.5 Equilibrium between a Pure Solid and an Ideal Liquid Solution. Change of Solubility with Pressure at a Fixed Temperature. Change of Solubility with Temperature. 14.6 Equilibrium between an Ideal Solid Solution and an Ideal Liquid Solution. Composition of the Two Phases in Equilibrium. Temperature Dependence of the Equilibrium Compositions. 15 DILUTE SOLUTIONS OF NONELECTROLYTES. 15.4 Vanâ? ?t Hoffâ? ?s Law of Osmotic Pressure. Osmotic Work in Biological Systems. 15.5 Vanâ? ?t Hoffâ? ?s Law of Freezing-Point Depression and Boiling-Point Elevation. 16 ACTIVITIES, EXCESS GIBBS FUNCTIONS, AND STANDARD STATES FOR NONELECTROLYTES. 16.1 Definitions of Activities and Activity Coefficients. 16.2 Choice of Standard States. 16.3 Gibbs Function and the Equilibrium Constant in Terms of Activity. 16.4 Dependence of Activity on Pressure. 16.5 Dependence of Activity on Temperature. Equation for Temperature Derivative of the Activity. 16.7 Deviations from Ideality in Terms of Excess Thermodynamic Functions. Representation of GEm as a Function of Composition. 16.8 Regular Solutions and Henryâ? ?s Law. 16.9 Regular Solutions and Limited Miscibility. 17 DETERMINATION OF NONELECTROLYTE ACTIVITIES AND EXCESS GIBBS FUNCTIONS FROM EXPERIMENTAL DATA. 17.1 Activity from Measurements of Vapor Pressure. 17.2 Excess Gibbs Function from Measurement of Vapor Pressure. 17.3 Activity of a Solute from Distribution between Two Immiscible Solvents. 17.4 Activity from Measurement of Cell Potentials. 17.5 Determination of the Activity of One Component from the Activity of the Other. Calculation of Activity of Solvent from That of Solute. Calculation of Activity of Solute from That of Solvent. 17.6 Measurements of Freezing Points. 18 CALCULATION OF PARTIAL MOLAR QUANTITIES AND EXCESS MOLAR QUANTITIES FROM EXPERIMENTAL DATA: VOLUME AND ENTHALPY. 18.1 Partial Molar Quantities by Differentiation of J as a Function of Composition. 18.2 Partial Molar Quantities of One Component from those of Another Component by Numerical Integration. 18.3 Analytic Methods for Calculation of Partial Molar Properties. 18.4 Changes in J for Some Processes in Solutions. 18.5 Excess Properties: Volume and Enthalpy. 19 ACTIVITY, ACTIVITY COEFFICIENTS, AND OSMOTIC COEFFICIENTS OF STRONG ELECTROLYTES. 19.1 Definitions and Standard states for Dissolved Electrolytes. 19.2 Determination of Activities of Strong Electrolytes. Colligative Property Measurement: The Osmotic Coefficient. Extension of Activity Coefficient Data to Additional Temperatures with Enthalpy of Dilution Data. 19.3 Activity Coefficients of Some Strong Electrolytes. 20 CHANGES IN GIBBS FUNCTION FOR PROCESSES IN SOLUTIONS. 20.1 Activity Coefficients of Weak Electrolytes. 20.2 Determination of Equilibrium Constants for Dissociation of Weak Electrolytes. From Measurements of Cell Potentials. 20.3 Some Typical Calculations for Î?fGom. Standard Gibbs Function for Formation of Aqueous Solute: HCl. Standard Gibbs Function of Formation of Individual Ions: HCl. Standard Gibbs Function for Formation of Solid Solute in Aqueous Solution. Standard Gibbs Function for Formation of Ion of Weak Electrolyte. Standard Gibbs Function for Formation of Moderately Strong Electrolyte. Effect of Salt Concentration on Geological Equilibrium Involving Water. The Entropy of an Aqueous Solution of a Salt. Entropy of Formation of Individual Ions. Ion Entropies in Thermodynamic Calculations. 21 SYSTEMS SUBJECT TO A GRAVITATIONAL OR A CENTRIFUGAL FIELD. 21.1 Dependence of the Gibbs Function on External Field. 21.2 System in a Gravitational Field. 21.3 System in a Centrifugal Field. 22 ESTIMATION OF THERMODYNAMIC QUANTITIES. Group Contribution Method of Andersen, Beyer, Watson, and Yoneda. Typical Examples of Estimating Entropies. Accuracy of the Approximate Methods. A.2 Numerical and Graphical Methods. Use of the Digital Computer.